Fact: not all Mediterranean Pasta Salads are created equal. This easy recipe is a twist on the classic, and includes exciting ingredients like sun dried tomatoes, kale, and salami. It is sure to become your new favorite pasta salad, and for good reason. Hi there, I’m Holly from The Modern Proper, and I’m here to take you on a magical journey somewhere in the Mediterranean…through food, of course. This pasta salad is inspired by all of my favorite Mediterranean flavors. It’s full of all the classic ingredients, plus a few unexpected ones as well. Sun dried tomatoes, olives, and feta as you might expect, but we’ve also added baby kale and salami for a little twist. It’s so good! If your summers are anything like mine, you’ve been to at least a dozen BBQ’s, baby showers and potluck dinners so far. I am always on the hunt for a great side dish to bring to these occasions and pasta salads are a dish I’m constantly drawn to. They are super easy, big on taste, and normally the only dish I don’t end up bringing home leftovers of, because it is always gobbled up quickly. While this summer side dish is currently at the top of my short list of favorites, I can’t help but let you know of a few others I love, as well. (Because sometimes you have to mix it up.) When I’m in the mood for something a little different, I like to make this Couscous Mediterranean Salad, and also this Summer Tortellini Pasta Salad made with pesto. They’re both quick to make, simple to assemble, and big on flavor! 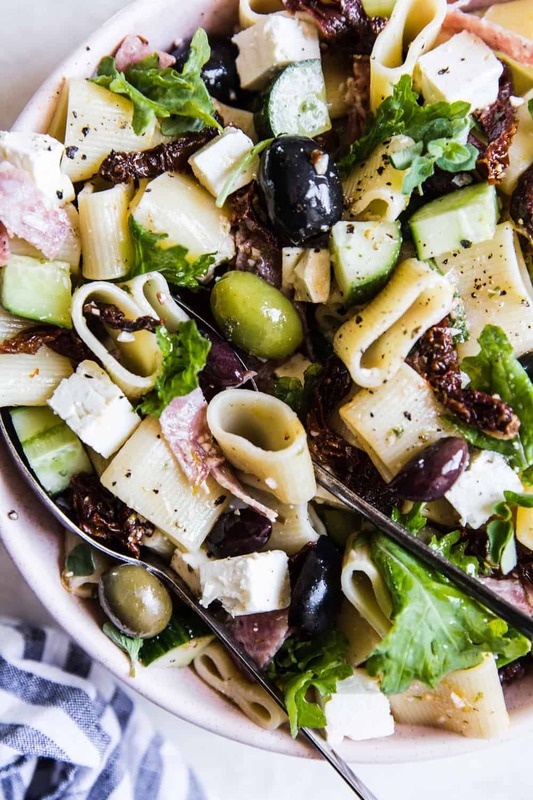 But, back to today’s star…this Mediterranean Pasta Salad. One of the great things about this dish is that it stays fresh for a long time and can even be made in advance. The feta, cucumber and kale are hearty enough that they don’t get soggy and maintain their great texture. The dressing on this Mediterranean Pasta Salad is perhaps one of my favorite things about it. It’s made using the flavored olive oil left in the jar from the sun dried tomatoes. These tomatoes are packed in olive oil, which over time infuses it with all of that tomato goodness, making it the perfect base for our dressing. With lots of red wine vinegar and plenty of oregano, it’s a winner for sure! So, the next time you’re on your way to a party and stumped with what to bring, look no further. 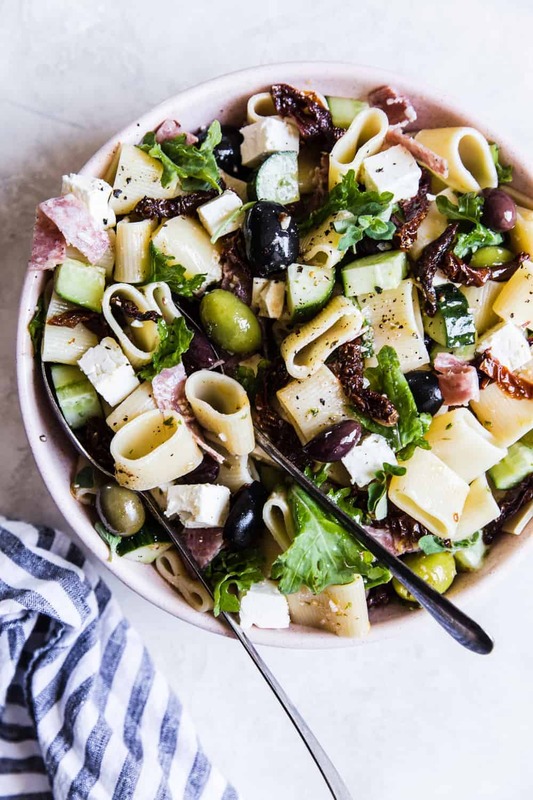 This Mediterranean Pasta Salad is the ideal dish to have in your back pockets for every crowd-feeding occasion. 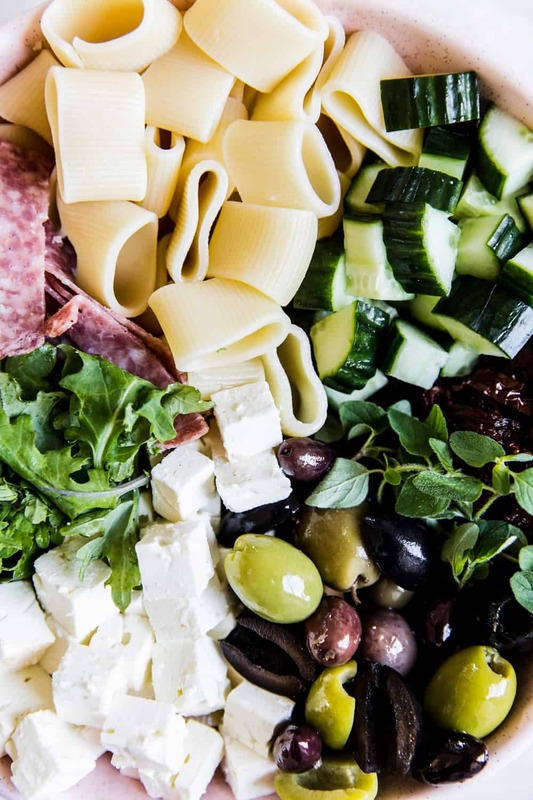 This easy Mediterranean Pasta Salad recipe is a twist on the classic, and includes exciting ingredients like sun dried tomatoes, kale, and salami. It is sure to become your new favorite pasta salad, and for good reason. In a small bowl whisk all of the dressing ingredients together until fully incorporated. In a large bowl, toss the dressing with all of the pasta salad ingredients. what is this pasta shape?